With Readly you can read Photoshop Tips, Tricks & Fixes and thousands of other magazines on your tablet and smartphone. Get access to all with just one subscription. New releases and back issues – all included. Since its release in 1990, not only has Photoshop gone on to become the market leader across Macs and PCs alike, but it has given life to a whole new way of creating media. 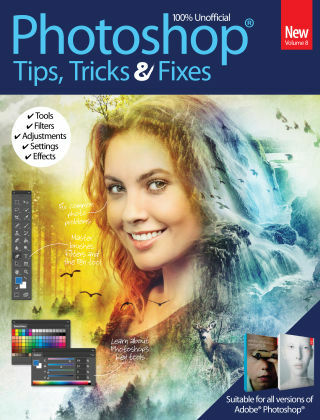 No longer only used for simply editing and fixing photos, now full-blown pieces of art can be created; photomanipulations and digital artistry are among some of the respected forms of digital art. In this book we aim to show you the full spectrum of what it is this amazing program can help you to achieve.